It’s half way through Fairtrade Fortnight 2011, 28th Feb-13th March. The most frantic time in the calendar for The Foundation to promote the core messages at the forefront of this consumer movement which started over forty years ago, although only commercially launched in 1988 by Solidaridad. The Fairtrade Foundation in the UK as we now know it (once 6 staff now over a 100) was officially established in 1992 by a mix of NGOs, CAFOD, Christian Aid, Oxfam, Traidcraft and the World Development Movement. The first Fairtrade Fortnight was celebrated in 1995. I have been very much involved in the last two, volunteering and working with The Fairtrade Foundation, Divine Chocolate, Cafe Direct and Ubuntu Cola, who are largely led by women. I am now more of an outsider, although still very much an advocate of fair and ethical trading within my personal life. A crucial aspect of the Fairtrade movement is the dedicated campaigners who are some of the most inspiring and determined individuals I’ve ever had the pleasure of meeting and working with. Without them this movement would be nothing. 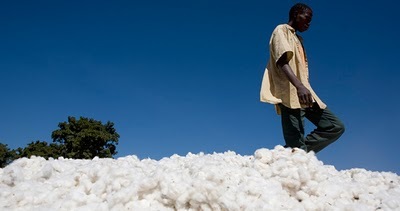 This year the key focus is on cotton, the most common natural fibre in the world, which is primarlarly grown in West Africa. Celebs such as Emma Watson are pushing the ethical trading message with the launch of Fairtrade cotton ranges by People Tree and Topshop. 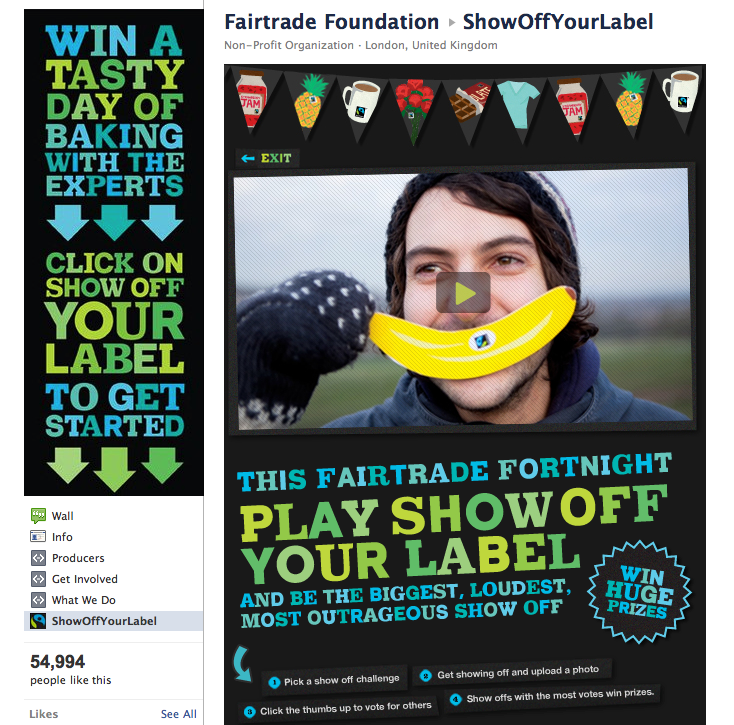 The core mechanic of this year’s fortnight is a Facebook based campaign ‘Show Off Your Label’ to increase the visibility of the label though sharing content, mainly through uploading fun images and encouraging your ‘friends’ to vote on them to increase awareness through online buzz . This is largely incentivized by a variety of prizes from Fairtrade licensees. A key way to join in this year’s activities is to be part of the more offline activity to set a new word record by ‘Showing Off’ the Fairtrade label by creating the longest ever hand decorated Fairtrade cotton bunting. This is happening all over the UK in homes, schools, universities, churches, offices and community groups. The great thing about this movement is that you can become a part of the change just through the way you shop, whether it’s in your local supermarket or an independent shop. We’re all part of the solution. Happy bunting.